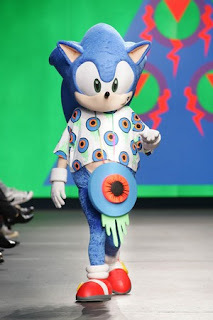 One of my current personal favourite designers is Watanabe. he can be considered a fashion outsider because he is something of an enigma and I think this is part of the attraction. I must admit that I've not really taken too much notice of him previously but now I am looking through his past creations and really enjoying what I'm seeing! Unfortunately menswear design is not really known for innovation but designers like Watanabe and (more recently)Throup are helping address this. I love how Watanabe deconstructs classics, for example taking apart white shirts or trench coats and exaggerating a facet or two, and then putting them back together for an entirely new and accomplished result. In an arena not exactly known for embracing groundbreaking innovation, Watanabe’s menswear has received particular acclaim. 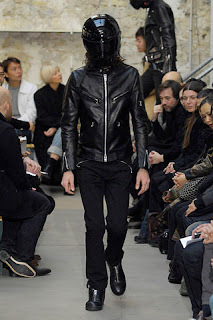 Although I like his s/s 2008 collection it is far too cold to be thinking about that season so I will concetrate on a/w 2007 and his bikerwear collection! 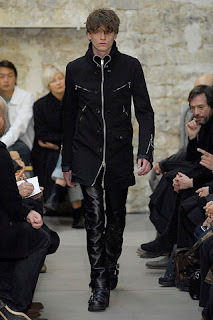 As I've come to understand the 'Watanabe way' is to leave no sartorial cliché un-deconstructed, so he broke down the biker jacket into its component parts—collar, belt, zips, etc.—and put them back together in unexpected ways, reminiscent of The Clash. 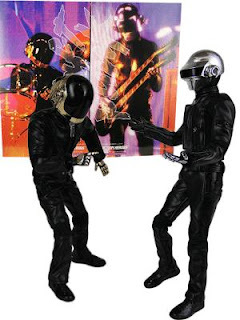 This image is courtesy of men.style - Daft Punk on the catwalk? 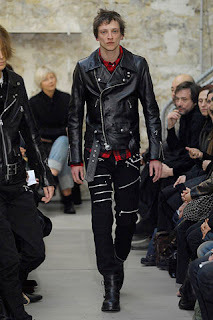 I'm in love with leather biker jackets right now and this show was one of the main reasons for this love to blossom. Not content on concentrating merely on the leather biker jacket he looked at cloth versions and added numerous zips...as I've mentioned previously I adore zips. Just look how Clash like this is! 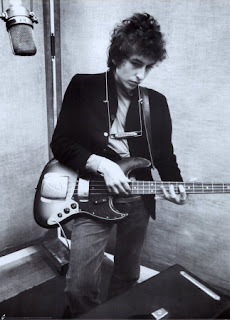 Love him or loathe him most of us are going to be seeing and hearing alot about Bob Dylan in the coming months. With the new biopic being released soon (check out the trailer here) and the release of a number of 'new' Dylan albums. I personally love him and there can be little doubt that he is more than just a music legend, he is a style icon too! Even women and not just Cate Blanchett want to get in on his style as seen on Catwalk Queen. There are many eras to Bob Dylan as shown by the recent biopic and this site (which I came across on my google search!) 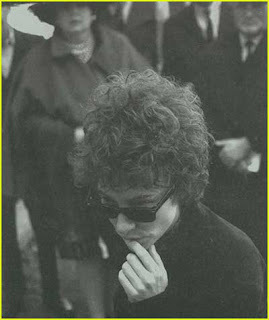 but for me there is only really one time in which Bob Dylan will be remembered for his style, mid 60s Dylan. he had just shaken off the Woody Guthrie and folky look and found a style of his own. He had the Wayfarers (which were back with a vengeance this summer! ), he had the skinny jeans, the biker boots and he had the attitude of the Beat movement! Playing Dylan during this time is (as I'm sure you have heard) Cate Blanchett. I've seen quite a few stills and she looks arguably the most Dylan like out of all the actors in this film. I've definitely seen a few female Dylan alikes around London over the last couple of months but Cate is definitely the best. Anyway, back to men's style! I expect to see quite a few men's style magazines commenting on Dylan's style. I've not yet seen any but I will keep an eye on it. I think the mid 60s Dylan look is very wearable today and is pretty perfect for those days when you are not too sure what to wear or even on Saturday mornings when you are a little hungover. Greetings from the floor of my living room! I am surrounded by boxes with my life (well, mostly my plates) packed in them. Moving at last! This does of course mean that I will be without proper internet access for an unknown period of time, but never fear as I shall try to comment/take over other people's computers. Anyway, back to the pic. 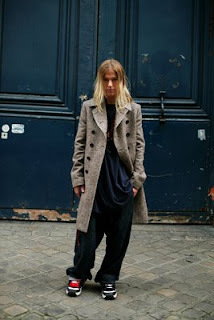 I (of course) really like this lovely, casual androgynous look. It's the kind of outfit you make up of stuff you haven't worn or thought about in ages, then realise that it looks pretty good and, hey, I should wear this hat more often. That bag is wicked too and so DIY-able. Mostly, though, I just wanted to draw your attention to this website. I think it's Ukranian, though correct me if I'm wrong. while some of the outfits are a little outlandish for me, I just love the photos. Also, I love the fact that it puts the total cost of the outfit... I get a bit jaded with certain street style sites that only seem to show people dressed in expensive labels (or blatently expensive vintage) . Oh, I just remembered a question I meant to ask you. Do men compliment other men on their clothes or is it just not done? I'm always telling random women that I like their shoes or their top or whatever, but always hesitate to do the same to men. Agony aunt, help me! It's saturday Morning and I'm in a funny moody. I'm so pleased that I'm not at work but then I've lost my gf for 10 days which also means that I've got no internet access either. So the next few days (other than arranging the internet for my own home) will include frequent trips to the internet cafe down the road. I hate those places! Anyway, back to your post. I've not come across this site before but it's cool. 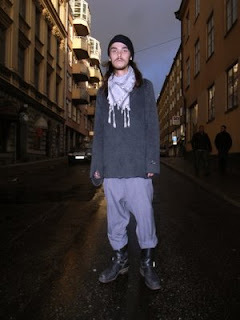 I like how it contains many facets that other street style blogs just don't offer. 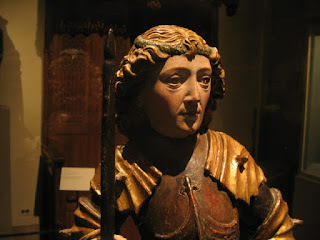 Such as the elaboration of the outfit and the various shots of key components of it. I love the case that your chap is holding and I agree that it would be fun to create something like this. My instant favourite on the site was this chap who is doing a fairly common look within the realms of Brick Lane and Shoreditch but is doing it really well. This chap would certainly be snapped by the likes of facehunter. 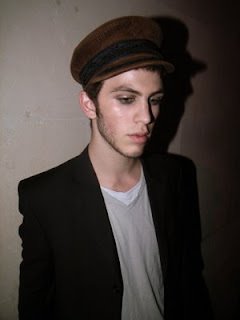 He seems to possess something though that many others featured on the styleblogs that I regularly consult. Yes the squash racket case is a little unnecessary but I like the style conscious humour of this outfit. Most of all i love the tie and the contrasting autumnal tone of the entire thing. Good find EJ! Now onto your agony aunt query. As your well informed Agony Aunt I can tell you that quite a few men do comment on each others style but the level of dialogue contained within this conversation can range from 'Nice shirt' to a lengthy discussion about rare trainers (which I have done after a few drinks). I'm not sure how many men would discuss this with random men though, I'm a little shy about it personally, I normally just look and admire. Overall, the style dialogue between the majority of men is nowhere near the levels of that between the majority of women and I'm not sure that it ever will, at least not in my lifetime. Unless of course I succeed in revolutionising how men think about clothes. I do think though that more men are thinking about clothes and of course thought leads to discussion (well hopefully). It's a little too early for this pseudo-social science exploratory investigation as I've not even had a Lady Grey this morning. It is an interesting question though and I'd like to open it up the readers...because amazingly we have readers now. What do you think J, Dustcakeboy, Stephen and friends? Can Carri Munden be one of the finalists for Menswear Designer of the Year? Can a brand that has been described as Cartoon Couture be taken seriously? I read this on FUK and I just hoped my eyes were playing tricks on me so I closed down computer went out to work and then came back only to read the very same thing! I've never really taken this designer seriously myself, gaudy colours and patterns; nothing else, this is a fad at best. 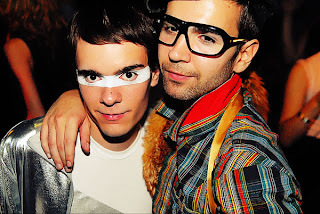 A fashion that accompanied the rise of Nu-Rave (I can't believe I even wrote that because the music scene doesn't even exist...I even like a lot of it!). I can see how for some London natives who crave neon colors, cartoon imagery, and outlandish graphics whilst listening to dance and electro (which I do myself but see no reason in having to wear such things!) this is an attractive label but outside of this novelty world, no. "Cassette Playa has a great approach to colour which I really respect and Carri's clothes really form and reflect that air of excitement flooding through London's young creative scene" - Nicola Formichetti (Executive Menswear Editor, Dazed & Confused and Another Man)....I concede that it could be seen (as Formichetti does) as refreshing in some way; an exciting, innovative approach to Menswear (which can be a tad on the safe side) but it's not for me and its not for most men. What do you think? Regardless it should certainly not be considered for Designer of the Year accolades and sit alongside the likes of Bailey and McQueen. If you are not aware of the label just click onto the website and you will instantly see how annoying it all is! I just hope Bailey wins. 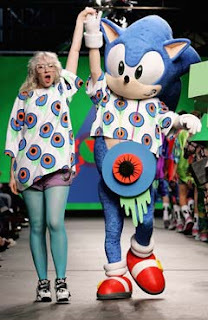 Surely he HAS to and Cassette Playa can have the continued support of Sega stalwarts. I was always more of a Nintendo kind of girl. I am currently watching quite a few Dior Homme items including a scarf and hat (as winter is certainly coming...it has been sooo cold in the mornings), a pair of waxed jeans (see the previous post about Joy Division) and most excitedly for me because the item is ending is soon; a pair of quite rare and in excellent condition Pierre hardy hi tops in white and grey. I used to almost pity the people at Uni who were so excited by ebay but now I have seen the light, I'm currently experiencing the high of this great online auction site. It truly is entertaining, quick and (unless I go crazy) good for my bank balance. For me it isn't about buying everything that I can (but maybe that's the next stage of this addiction) I am enjoying the search and the voyeurism that it allows. I will keep you posted on my new addiction. Please intervene if required. Given that I'm such a nerd, I'm surprisingly Ebay-phobic. I'm actually online clothes shopping phobic too, as I love seeing stuff in the cloth, trying it on at least twice and stroking it an inappropriate amount in the shop before buying... the best buys are ones you slowly fall in love with, think about for ages before buying and then wear to death (well, apart from the uber-bargains like my New Favourite Coat)... no? What puts me off is not knowing that you're going to get it. When I want something, I want to know I'm getting it. Not to wait 3 days 7 hours only to be sniped- curses! Still, I have heard stories that tempt me... keep us posted on the purchases. 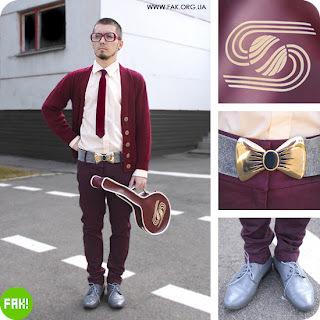 and the future is...men wearing a cross between brogues and sandals, I call them Brandles (More on these later.) More importantly though I've mentioned my love for B Store which stocks some labels and of course budhahood shoes. 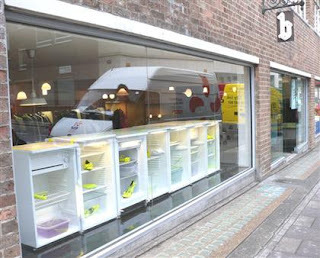 B store has been a mecca for new fashion talent since opening in 2000 and it now has an immaculately displayed Savile Row boutique. I've managed to get my hands on some images from a recent press day where some great and interesting items were displayed from the labels which can be found inside 24a Savile Row. Above is a collection of shoes. I've mentioned that the boutique is best known for the footwear it offers - (budhahood shoes). I'm liking the grey brogues very much. The three on the left are intriguing. A cross between a shoe and sandal - the brandle. I don't think many could pull this off but it certainly is an interesting idea. 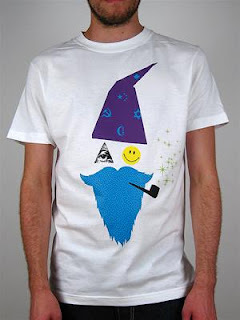 This design could be the answer to the ever annoying conundrum of 'what pair of shoes do I wear with those shorts?'. The ordinary shoe can look to clumpy and many trainers can spoil the more tailored look of smart shorts - This wasn't an issue for me over the recent summer because I didn't wear shorts once. My legs are still as white as Santa's beard. I've not taken EJ to this store yet but next time she visits I will certainly take her. It is everything a shop should be. 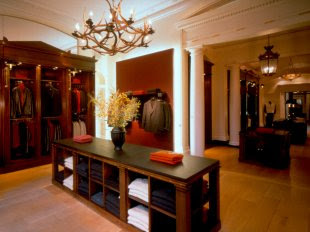 Great designers on offer, beautifully displayed and friendly staff. Bring on January when the above should be available and I should have some Christmas money left! We haven't been shopping in London for an age, have we? We'll have do a proper trip sometime soon... window shopping only of course as I am incredibly poor right now. I love those shoes. LOVE them. Please never call them brandles again though. I think you will need to try them on and take a picture so that I can get my head around them a bit better. What would you wear with them? Contrasting socks? No socks? Hmm... I may have to buy these for myself. Quite like that jacket too. Very Clash. 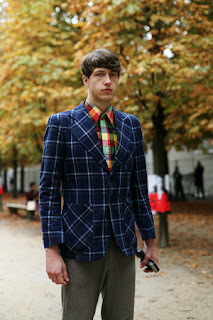 This image comes courtesy of the sartorialist during his recent trip to Paris where he has taken some beautiful shots. This one however is a little more controversial than the typical highly groomed and perfect ladies on offer. To be honest by the end of my own visit I was so conditioned at seeing manicured model women wearing this seasons shoes and clutching this seasons bag that by the end of it they just didn't register in my brain, they just blurred into one person. The below shot is more interesting to me. I've looked at this shot a few times now over the last day or so and can't make up my mind on it. I'm certainly swaying towards the disapproving side of the line but it is not a resounding feeling. Firstly, I'd like to see the look with the jacket off. I like the idea of combining a well cut, smart jacket with a street wear outfit underneath. However, here it does look like the guy has come out of dance class but only has one coat (the greasy hair only adds to this notion!). I like the coat but I agree with one of the comments on thesartorialist that the sleeves are too long. For this type of look to work I feel that the jacket needs to fit perfectly. The play on proportions of the loose street wear complete with bulky trainers (I like the use of two coloured laces!) matched with a well tailored coat could work. However, this chap doesn't pull it off. It makes him look very short and his hair doesn't help him one iota. It is however an interesting look and worthy of a little discussion. What are your thoughts? Frankly, I'm not sure it IS a man. Not in a bad way, if that makes sense. The hair bothers me SO much (got to stop the capitalisation), I just want to wash it, brush it and pull it back. I really don't know how people deal with hair hanging in their face like that... been there done that, shudder at the thought. UPDATE: I've just realised something! This guy is clearly just channelling John Cusack in Say Anything. It's all so clear now! Apologies if I got you excited with the post name, this isn't a post about Jimmy Saville's style but I want to talk about the other Savile. From an early age (far too young to be even thinking of suits) I've wanted to be have a Bespoke Suit from Savile Row (yes I accept I was a strange child). 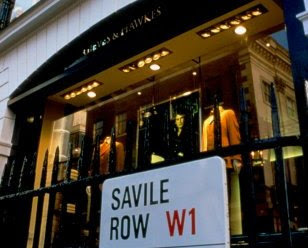 For me and many others Savile Row is a symbol of the very best in men's dress. Bespoke tailoring can be seen as the Haute Couture of men's style and Savile Row has dressed every icon of male elegance from Nelson, Valentino and Astaire to Sinatra and Jagger. I will focus this post on one tailor in particular but I am sure to return to some others during my future posts. It is fitting to begin my exploration of Savile Row at Number 1 and at this address I find Gieves & Hawkes. I won't bore you (too much) with the details although I find it interesting (I'm such a geek) but they do help illustrate the great history and almost institution like status of the tailors found along this street. The company formed from two businesses who were already famous in their own right, Gieves (which was founded in 1785) and Hawkes (which is even older, founded in 1771). Gieves & Hawkes has received Three Royal Warrants which has seen over 200 years unbroken service to successive monarchs. For any historians out there King George III was in power during the first warrant. Famous customers include Lord Nelson and The Duke of Wellington. Tailoring has always been an intensely personal business. 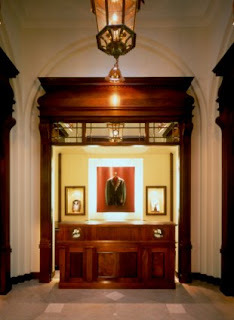 Today one of the challenges for Gieves & Hawkes is to provide the same personal touch to a fast-growing number of customers (the lucky ones who can afford it as prices for the full tailoring service begin at £2,250), adapting to their current lifestyles, to modern fabrics and to society's ever-changing ideas on how to look one's best. Helping them adapt and evolve is Joe Casely-Hayford, who helped define The Clash's military look and has dressed U2 and Lou Reed. As creative director Joe Casely-Hayford has now finished his third collection and is taking traditional English Tailoring and giving it a new twist and in the process is decking out new dandies in timeless elegance. Caseley-Hayford was also the first in what has become a long list of designers to collaborate on a diffusion line with TopShop, it is no longer only for monarchs or diplomats, the image and creative vision of the house is of beautifully made, bespoke clothing, one that would suit any gentleman (who save up for it!). 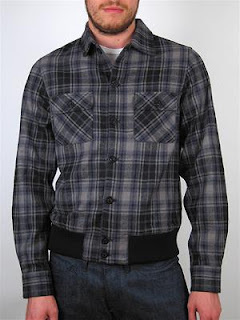 Something I'm pondering at the moment is what appears to be a minor trend in the male hipster world. Something I am utterly jealous of, yet thankful I don't have. A bold affirmation of manhood. 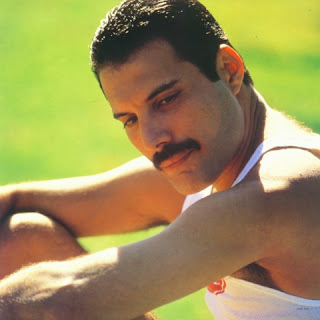 I am speaking of the moustache. Now, I'm not sure how I actually feel about this. Part of me, probably the same part of me that used to want people to wear skinny trousers, wishes that more men would grow one. Lord knows I've tried to persuade those around me. But in reality, is it such a good idea? Let's look at a few examples. 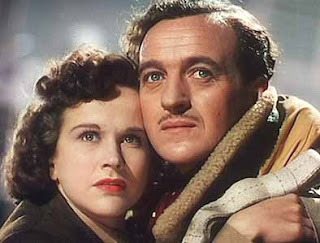 There are plenty of examples of (what I consider) the classic 'tache. With slicked back hair or a neat hair cut and a sharp suit it keeps the look interesting, and a neat tache shows that you take care of yourself. 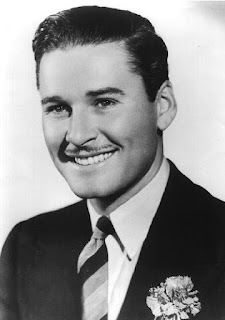 It's this next type of moustache that I'm most indecisive about. 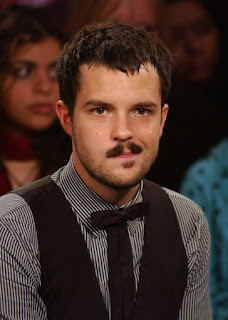 Brandon Flowers of the Killers. It may be controversial, but I love his look at the moment, he can do no wrong. Picture courtesy of Facehunter. Quite extravagant, but not over the top. I think it works for me because the rest of the look is quite minimal. There are no conclusions here I'm afraid. I'm as torn as ever but would love to hear other people's opinions about it: do you/have you/would you wear a moustache? If you are thinking about it, you may want to have a look here. If you go for it please send us a picture (we love hearing from you); the email address is on the right hand side of this page. Once my next stage of puberty hits and the desire arrives I might grow a slightly thinner version of the above. This will be me as I spend all day in my study, reading, writing and taking in the countryside. YMC shirt. You should know that I like this brand. Image 1 is courtesy of Facehunter. Traditional but stylish and I think it looks good. Image 2 is courtesy of DDD. I saw this in guy and thought it worked well although the image here doesn't show it in the best light. Think I prefer the first one (and not just because he's prettier)... so Oliver Twist-y it almost hurts. I think this would work really well as a low key look for those sick of eye liner- it's certainly what my makeup ends up looking like by the end of the day. Teeny bit of shimmer on the cheekbones and done. Men's makeup, I feel, shouldn't take more than about 5 minutes, though I'm not sure why. The second look looks a bit like Adam Ant who missed. Or maybe the fifth ninja turtle. Bonjour! Back on the same island at last! Bon soir! It is great to have you back in ol' Blighty! I am so tired but couldn't resist replying to this post! Seriously, it was BAD idea getting the Eurostar straight to work this morning, not only did it mean an early start but it also meant I had to go to work resembling a drowned rat...and I wanted to be the personification of Paris Chic! I have come across these before and they are on my wish list. Patent shoes and accessories in general though are so damn appealing. Just like a magpie to silver I am drawn to black patent trainers wanting to take each pair I see away with me back to my nest. These are better value for money than any others I've seen in recent shopping outings. The Hi tops are currently the best way to wear these though but it is nice having that option to transform the shoe. I'm interested in seeing these up close so I can examine the mechanism/fastening. I definitely have to see them in the leather. The images make the first two options look really clumpy and I like sleek trainers. The Lanvin Hi Tops are higher up on my wish list. Speaking of which, I drooled over the Lanvin window yesterday. 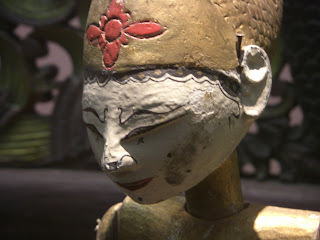 I will post within the next day or so about the cool style facets I saw during my time in Paris. I've seen plenty of well dressed guys in Paris over the last few days. Guys who have made me look at my own wardrobe and feel a little short changed. Of course there have been quite a few poorly dressed along the way. However, nothing can compare to these two finely dressed gentlemen. I came across them in the Palais de Tokyo which has a plethora of cool within it's walls! I really want these. I might be too old for them but come on. They are so damn cool. 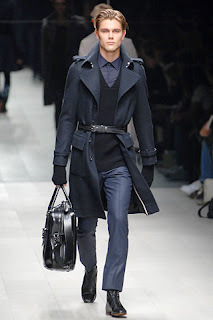 My autumn/winter syle is inspired by it! They have fully functioning zips and everything. During the Lanvin a/w 07 show there were a few good elements but the hi tops stole it for me and I really want a pair or something very similar. Now all I need to decide is which colour I want. The patent black is currently edging it. This stylish gent was in the Natural History Museum in New York. Love the gold, the hair and the eye makeup. This chap was in the New York Metropolitan. Loving the hair, shoulder pads and daring head band. I know I've said this before, but normal service WILL resume soon from me... something about shoes methinks. Must go, Charlie Brooker is on TV. 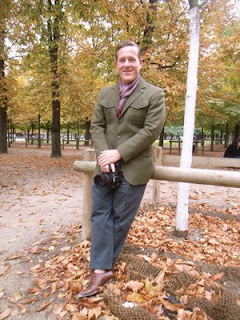 In the red corner, sockless and wearing navy trousers and olive green jacket with interesting neckwear, weighing in at 180 lbs, the undisputed champion of Street Style blogs...Scott 'the perfect amount of cuff on display' Schuman. And in the blue corner, wearing a clash of check, the undefeated challenger...Yvan 'likes his eye candy' Rodic. As you can see I am a little overexcited about going to Paris. Apologies but can you blame me? It was cool coming across some mutual love between two of the heavyweights of street style blogging! 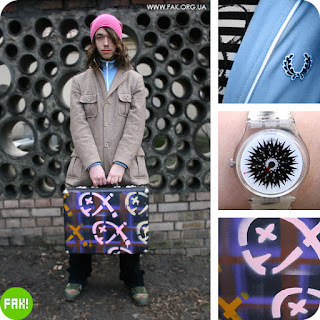 I came across Yvan (Facehunter) on sartorialists style.com blog and the compliment was soon reciprocated on Facehunter. OK I must get back to washing and packing. What a crazy life I lead. You SAW the SART?? Right, friendship terminated. I think the facehunter wins here, but ultimately my heart belongs to Scott and his shots of grown-up style I can aspire to. Teenagers already make me feel bad enough about myself, without having to be told every other day that they're ten times more stylish (and, apparently, richer) than me.